Did You Know Yeshua Jesus's Name Is All Over The Old Testament ? Did You Know Yeshua Jesus’s Name Is All Over The Old Testament ? We often think that the name of our Messiah can only be found in the New Testament. Did you know that His name is all over the Old Testament as well? You can look up scriptures that deal with “The Word“, or “salvation” to find Yeshua in the OT. 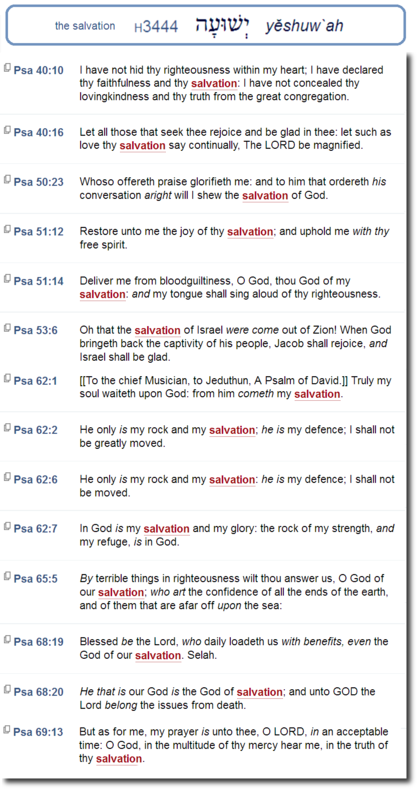 In this post we reveal just the locations where the word “SALVATION” is found. Behold, EL is my Yĕshuw`ah; I will trust, and not be afraid: for Yĕhovah is my strength and my song; he also is Yĕshuw`ah. Therefore with joy shall ye draw water out of the wells of Yĕshuw`ah. Next articleCashless Denmark: Are We Quickly Accelerating Towards The Mark Of The Beast? Was Jesus Just A Man Or Was He God? – Powerful Proof Of Who Jesus REALLY IS! Claiming your translation is a “literal word-for-word” translation?